Many dog parents wonder if garlic is safe for their dogs, and if so, how much can be given to the dog. They also want to know the health benefits of garlic for our dogs, and whether all dogs can be given garlic. This page covers these topics and more! Read on and find out! In this page, you will find well-researched information on garlic for dogs which I hope will help clear up some of the confusion you may have about garlic. How much garlic should we feed to our dogs? Which form of garlic should be used? Garlic has long been used as a safe medicinal plant in holistic medicine for people and pets as well. However, there has been a lot of controversy surrounding the safety of garlic on dogs (and cats) due to its properties as a member of the Alliumgenus, a branch of the lily family, along with onions and shallots. Does that mean garlic is unsafe for dogs? Not quite! This 2004 study has led the researchers to retract their earlier suggestion that garlic is bad for dogs. In fact, they concluded that this herb has "the potential to promote immune functions and prevent cardiovascular diseases." The bottom line? Use common sense! The key to safe use of garlic on dogs is the dosage level and frequency of use. As shown in the 2000 study, for a dog to develop abnormality in his red blood cells, he would have to eat A LOT of garlic to even begin the oxidative process. A healthy 50-pound dog may have to eat a whole 5-oz onion, or over 20 cloves of garlic, to start the Heinz-body process. Since red blood cells are constantly regenerated from the bone marrow, a dog would likely need to ingest this much amount of onion or garlic on a repeated basis to cause permanent harm. ​According to Gregory Tilford, (author of All You Ever Wanted to Know About Herbs for Pets), dogs can quite safely consume 1/8 teaspoon of garlic powder per pound of food 3 to 4 times a week. Health Benefits of Garlic for DogsGarlic has been used for thousands of years in Chinese and Ayurvedic medicine. It contains at least 30 compounds that have been found to be useful for a variety of conditions from skin disorders to cancer. 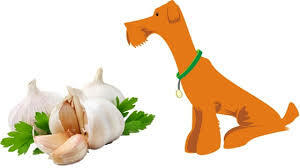 In fact, holistic veterinarians have been recommending garlic for many years for its multiple health benefits. Boosting the Immune System: Garlic stimulates immune functions in the bloodstream by increasing the activities of killer cells (cells that seek out and destroy invading microbes and cancer cells). It is therefore beneficial for dogs with suppressed immune systems and dogs fighting cancer. Moderate garlic supplementation in the diets of even healthy dogs can boost their immunity and prevent cancer. Tick/Flea Repellent: The exact reason and extent of garlic's effect on tick and flea prevention is not clear. It may be due to the odor released through the dog's skin as the compounds in garlic are metabolized. Whatever the reason, there are a lot of anecdotal reports on the effectiveness of garlic (especially in combination with brewer's yeast) as a tick/flea repellent. ​Which Form of Garlic Should We Use?Not all forms of garlic are the same - garlic that has been cooked under high heat (boiled, roasted, sauteed, etc.) 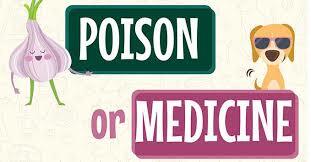 is likely to lose its medicinal properties and a high percentage of its nutrients. Most of us know Tumeric as a spice for cooking, but did you know that this fantastic herb can really be beneficial for our dogs? Don't want to use conventional flea products? Here are some alternative ideas. 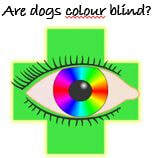 Do you know what colours your dog can see? Do you buy thier toys based on these colours?